3590EKR indicator complete with battery and transport case. - Two RS232 serial ports, for connection to printer, PC or PLC, radio module, and optional interfaces. - One RS232 serial port (optional RS485), for connection to repeater, remote scale, badge reader or digital load cells. - Fitted keyboard emulation input, for barcode/badge readers or external PC keyboard. - 4 optoisolated outputs (optional). - 2 optoisolated inputs (optional). - Recording and filing of all the information on PC, complete with the calibration data of each instrument. Fitted with 4 connectors for connection up to 4 platforms with AF08 software (up to 2 with AF03, 1 with AF09). Built-in rechargeable battery (10-hour minimum operating time) with fitted external 12 Vdc / 230 Vac adapter. 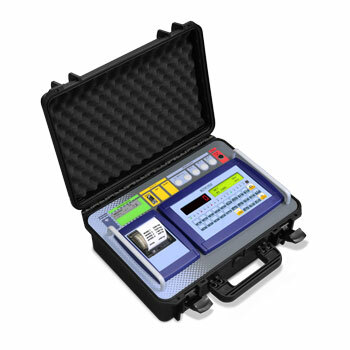 3590EKR Indicator with transport case, printer and AF09 software. 25-key keypad, LED display and backlit graphic LCD display. AF01 Software for totalization and formula weighing. AF02 Software for pieces/quantity counting. AF04 Software for statistical checking of prepackaged goods. AF05 Software for price computing and industrial labelling. AF08 Software for static wheel and axle weighing with 2 or various platforms. USBCKR (S1) Built-in USB port kit for indicator in transport case. Complete of USB key for PC.